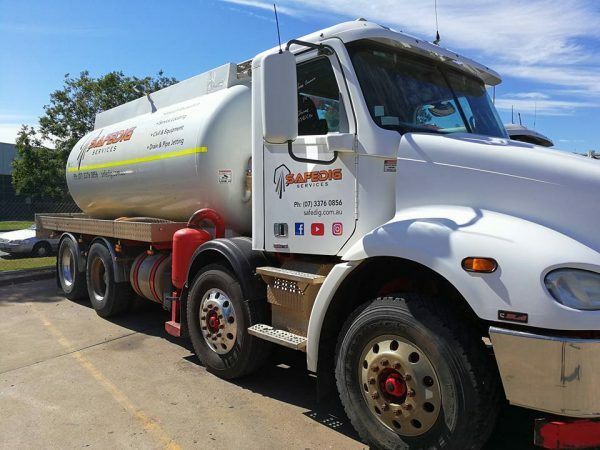 Vacuum Tanker for hire in Brisbane, Gladstone and Mackayg! A relatively new addition to our fleet, this is Safe Dig’s BIGGEST truck and will be exceptional value to our customers – Bulk loads means cheaper prices for you! We’ve recently brought this truck onboard to service a relatively new niche in our North Queensland region with a specific focus on Gladstone, Mackay and Rockhampton areas. With an increase in pit pump outs and long-distance liquid cartage for our major clients including Remondis, this massive 16,000L truck has come onboard to serve as a regulated waste and excess water carrying vehicle. We’ve also made excellent use of this truck in remote locations as we’ve been able to carry enough water to last the distance, making use of this vehicle for extended jetting and culvert cleaning operations. Great for pump outs and pit cleans!